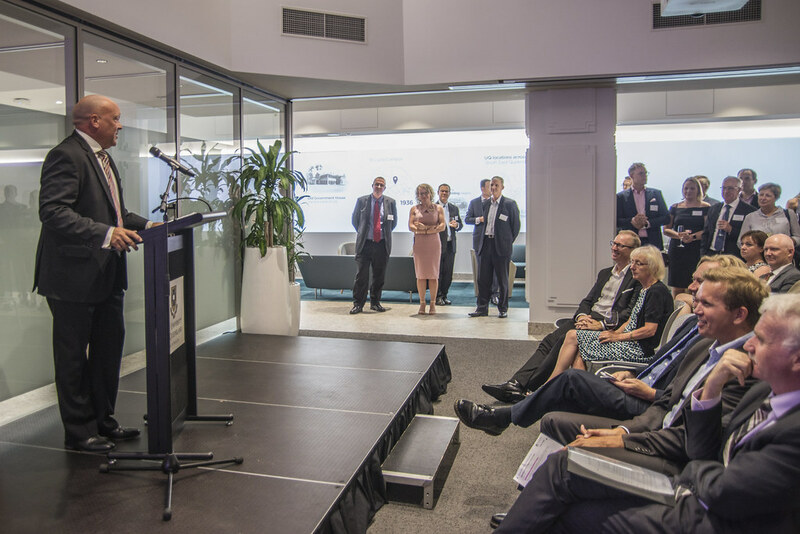 The University of Queensland’s new UQ Brisbane City site at 293 Queen Street was officially opened this week by Provost and Acting Vice-Chancellor Professor Aidan Byrne and guest of honour Mark Sowerby. More than 120 business leaders, including alumni, partners and friends of the University, gathered to tour and explore the custom-built learning and meeting space, which provides a place to learn, connect and do business in the heart of the city’s financial district. Prof Aidan Byrne opens UQ Brisbane City. Professor Byrne said UQ’s return to the city was something of a homecoming. “Those here who are familiar with UQ’s history will know that the very first classes were taught just around the corner at Old Government House in George Street,” Professor Byrne said. “Our return to the CBD is critically important to the University’s mission, but it’s not without irony either – the earliest administrators of UQ simply couldn’t wait to get out of the George Street accommodation. “From day one they expressed their frustration at the unsuitability of the site. Professor Henry Priestley, one of the early professors, complained of its inadequate design, lack of student common rooms, white ants, leaks, and even collapsing ceilings. In some lectures, students were taking notes while standing outside and peering through the windows. “In this context, the gift from James and Emelia Mayne that enabled the purchase of the St Lucia campus was something of a godsend. “Now, we have come full circle. “While the early professors were certain they wanted out, today we’re just as adamant we want in – we need a contemporary space in the CBD where students, alumni and our partners can learn, connect and do business now and into the future. Prof Iain Watson addresses guests. UQ Deputy Vice-Chancellor External Engagement Professor Iain Watson said the site would be a catalyst for more and deeper collaboration with industry, government, alumni and students. “A university such as UQ in a city such as Brisbane needs to be part of the community by being present and engaged in city life,” Professor Watson said. “Our vision for this site was to build a place where people come together to create change – in themselves, in their workplaces and in their communities. “This exceptional space will provide many opportunities for partnering in research innovation and delivering impact, for upskilling staff and leaders through our postgraduate and executive education programs, and for producing game-changing graduates who will help us create and shape the industries and products of the future. Guest of honour Mark Sowerby. Blue Sky Alternative Investments Ltd, Queensland’s inaugural Chief Entrepreneur, UQ MBA alumnus and guest of honour, Mark Sowerby, said this was an incredible leap forward for UQ and at exactly the right time. “The power of random collisions, networks and being visible are vitally important in business,” Mr Sowerby said. “Timing matters as well – UQ’s undergoing a change and so is the state and the country. Now is the right time for this space to be here. “Spaces such as this bring people together, and great things happen when you sit down with someone, you listen to their story and you believe them – it turbocharges Queensland. “Importantly, this space will also bring together people with ideas and people who make things happen, so having a place like this is an important part of the commercialisation process. UQ Brisbane City is home to UQ’s executive education and postgraduate business programs, and is operated by the University’s Faculty of Business, Economics and Law. To enquire about meeting spaces for hire, please visit the website or email venue@business.uq.edu.au. Contact: BEL Faculty communications, Gemma Ward, media@bel.uq.edu.au, 0439 651 107.